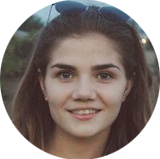 Nowadays there are plenty of writing services that offer you to get an essay or another type of writing of high quality in a short period of time and with a small amount of money spent on it. But are they really as good as their colorful and impressive front pages on the Internet? I guess, no. And I have some reasons to think so. Student life can be very hectic, and sometimes we have got no time to complete the tasks. That’s why such services as Essay Click become in handy. All you have to do is to tell what kind of writing has to be done, the topic and the deadline. Sounds easy, doesn’t it? But there are some pitfalls you should be aware of not to be fooled or left without any writing at all. 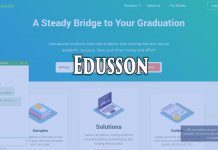 I want to share my experience of using Essay Click with you and warn you about possible troubles. I liked the front page very much at first. Everything seemed easy and fast. I needed the essay on a specific subject, and there was nothing complicated in making my order. But, as you know, the first impression is not always right. And in this case, it was deceptive. 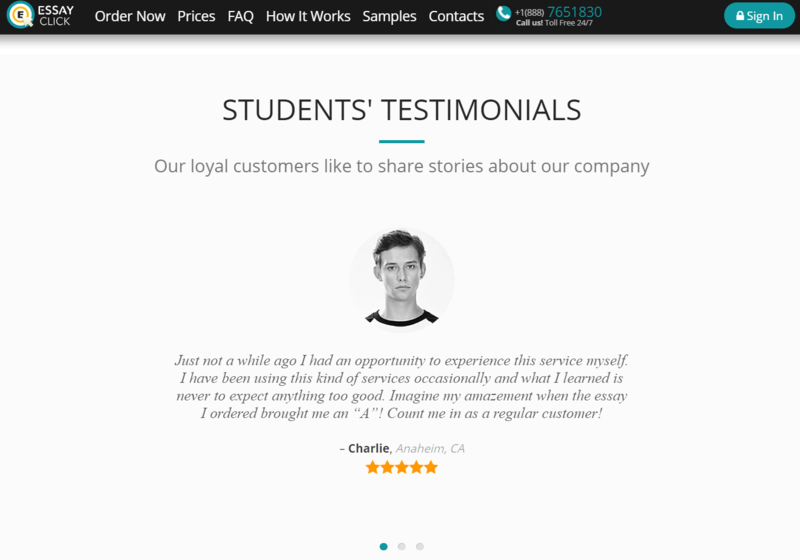 I have to say, the design of the website is great. 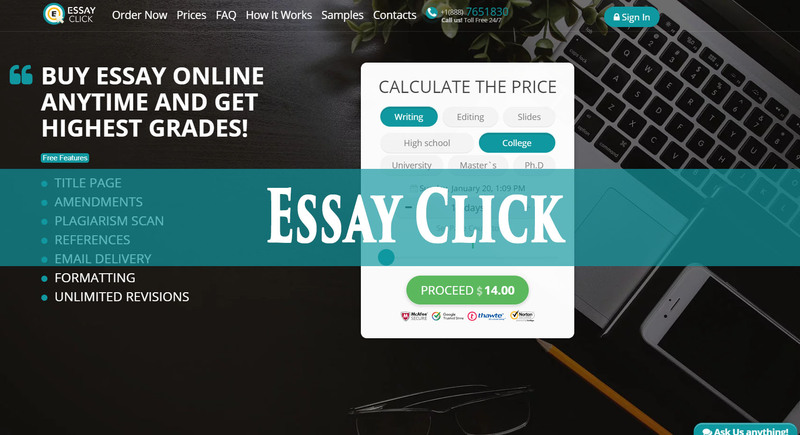 Essay Click has three major directions of work: writing from scratch, editing of the papers you already have and making presentations. Also, you have to choose what your paper is for: high school, college, university, Master’s degree or Ph.D. Afterwards, you write down the deadline and select the necessary amount of pages. That’s the time when the price shows up. The weird thing happens after that. You have to pick up the author by yourself. The question is: how do you know who is good for the job you offer? I thought that was the responsibility of the service to choose the right person for a specific kind of writing. So, that was a surprise to me. 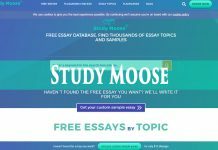 That’s very convenient that Essay Click offers you three main services that most students need, but there is no information on how exactly the writers can write for you. Different subjects have different writing methods, so you have to be aware of that before paying for anything. The service can charge you differently. It depends on how many days you need to have your writing paper done, amounts of pages and topic, of course. 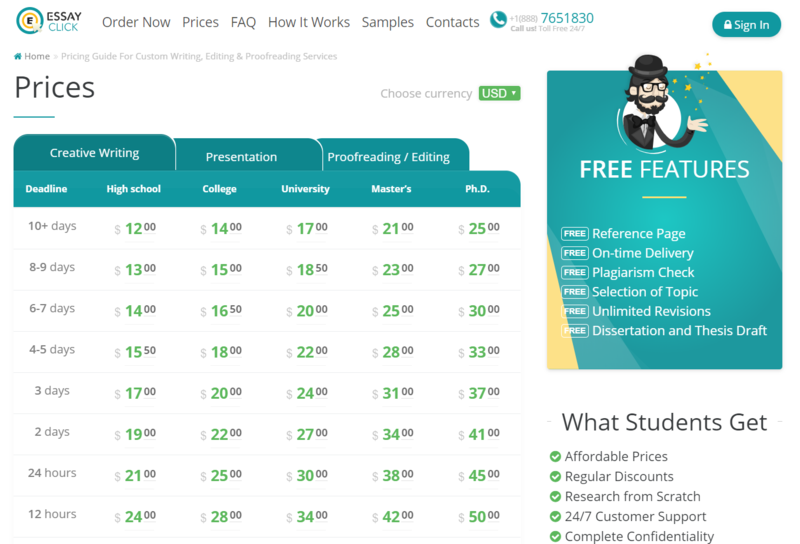 For example, an undergraduate essay done within 10 days will cost you approximately 28$. Unfortunately, there are no discounts for that student, who place their order for the first time. But you can get some deal when the paper you need will be quite large. The biggest problem here, however, is refund policy. It’s much stricter than advertised and, as it turns out, the chance you will get your money back is quite poor. When you have some issues with the service, you can write to them for free (as soon as you sign in), or call their support number. But after spending some hours on reading student’s reviews on Essay Click, it’s completely impossible to prove them wrong and get your money back for bad writings or not meeting a deadline. This situation makes me feel insecure, and I think it would bother not just me, but other future customers too. “Not all of the orders are done well. The quality depends on your luck” — this is the main idea of almost all reviews on the Internet about Essay Click. My experience can’t be called positive, so I agree with all the comments. After making my order I was quite sure, everything will be fine, as my topic wasn’t hard and I needed just a simple essay. But I was wrong. After I got my paper, I realized that was not what I wanted. The writing had to be for my university class, but I got an essay of a poor quality, and I’m not even sure it was written by a native speaker. The combinations of words in sentences were not always correct and, plus, there were a lot of those that are not used in our language for a long time. I think you should learn about the author you are assigned to and be sure he or she can write what you need. Not all of the people who work there have the qualification in a specific area of science or art, and that’s okay. But I want to know that my money will be well spent and I get the writing which I can use eventually. My advice is to read the reviews first and learn about the authors before using any writing service. Maybe, you will find something better and have a choice between a couple of sites which you can use. 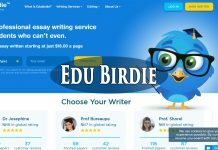 Everybody, who decides to use writing services for college or university classes, wants to feel secure when it comes to deadlines. Most students say they got their orders on time, but there are a lot of those, who had issues with that. I think it might be the biggest problem, because customers, in most cases, have sharp deadlines, so the time spent on writing the paper stands in the first place. Many customers don’t get their orders before the specified time and sometimes even one or two days after that. They can have it delivered so late that they don’t need it already. In this case, they lose their money, time and have problems at school or college. Luckily, I didn’t have problems with meeting the deadline, but I’m sorry for those students who had that experience. The funny thing is, you don’t know if they will manage to complete their job on time or not, and that freaks me out. Attractive design. The website offers the well-grounded structure of its services shown on the front page. Bad quality. The clients often complain about the bad quality of the writing they receive, which is related to poor grammar and content issues. Diversity. Students can order any types of work they need ranging from writings from scratch to presentations. Choosing the author by yourself. The client is able to choose an author for the writing he orders whereas he cannot be acquainted with his style of writing. Difficulties to get a refund. The website offers poor refund policies that make it difficult for a client to get money back. Late delivery. Customers complain that the writers often miss their deadline and send them one or two days later. 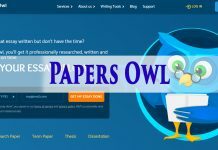 After I used Essay Click, I’m sure it's not a piece of cake to find a good writing service. You can find a lot of them on the Internet, but the chance you will be satisfied is pretty small. I wasn’t happy about my essay at all and, in the end, I wasn't able to have my money refunded. After reading the paper that has been delivered, I had to correct it a little bit. In addition, there is no real reviews on the official site, only fake comments. I believed it and now I regret using it in the first place. My points are 3/10. I don’t recommend you to use Essay Click because here clients are not fully protected from lying, there is a chance of delaying your order and, in case you don’t like the result, you won’t be able to get your money back.